The Fisker brand might not have lasted long, but its owner, Henrik Fisker, knows how to draw a car. Apart from the Karma, he also penned the Aston Martin DB9 and V8 Vantage, the Artega GT and the beautiful BMW Z8. This is why, when he announced that he would create the ultimate muscle car, we were eager to see what he would come up with. Based on the 2015 Ford Mustang, Fisker’s car has been built in partnership with Galpin Auto Sports, a subsidiary of the Galpin Auto Group (the largest Ford dealership in America, and a big name in the tuning scene). The car is named the Rocket, and as the name suggests, it probably takes off like a missile. The look of the car is completely different, and for a very good reason: all the bodywork has been replaced by new parts made from carbon fibre. The huge front grill is split down the middle by a large chrome bar, a homage to the 1964 Mustang. The interior is typical for a one-off car: made from red leather and stitched in white, the whole cockpit has a quality feel to it (it is, of course, hand-made). The driver sits in a Recaro seat, and faces a dashboard littered with carbon fibre. To make sure this car won’t lose a race to a stock Mustang, Galpin equipped it with a heavily-modified version of the 5 litre V8 found in the stock Mustang GT. Developing 725 horsepower, this mill is paired with a six-speed manual. An adjustable suspension and Brembo brakes help the Rocket get out of corners in one piece. 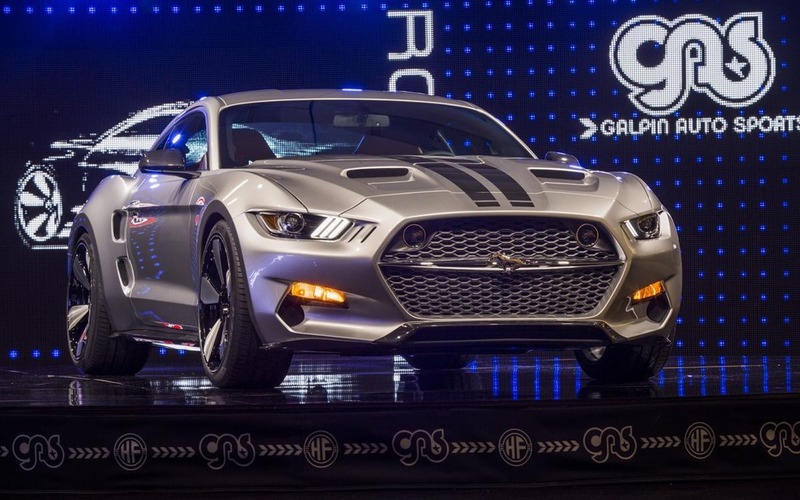 The Rocket’s production will start next month, and Galpin expects to deliver the first car early next year. As far as pricing goes, Fisker hopes it will be around $100,000, meaning it will compete with the Jaguar F-Type and the Porsche 911. After a long tease, Ford has unveiled the Shelby GT350, which will sit at the top of the Mustang range and bear the performance flag for the brand. Intended as a track-focused car, it should be able to embarrass exotics on a circuit (and not only in a straight line). News How About A Truly Unique Aston Martin Vanquish?